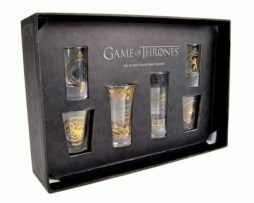 This Game of Thrones drinking glass set is a collectable and premium set of six shot glasses featuring famous quotes and house sigils. 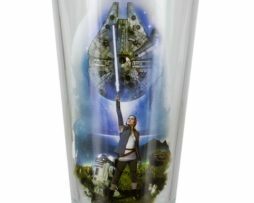 The two largest glasses (100ml) feature the quotes “All Men Must Serve” and “All Men Must Die” with their High Valyrian translations “Valar Dohaeris” and “Valar Morghulis” respectively. One of the two medium sized glasses (75ml) features the Baratheon house sigil, a crowned stag, while the other features the Targaryen house sigil, a three headed dragon. One of the two smallest glasses (50ml) features the Stark house sigil, a direwolf, while the other features the Lannister house sigil, a lion. Each glass features beautifully intricate designs in both gold and silver metallic finishes. 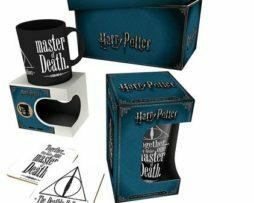 Housed in a printed gift box, this is perfect for collectors and makes a wonderful gift for any Game of Thrones fan.